Lighten up! 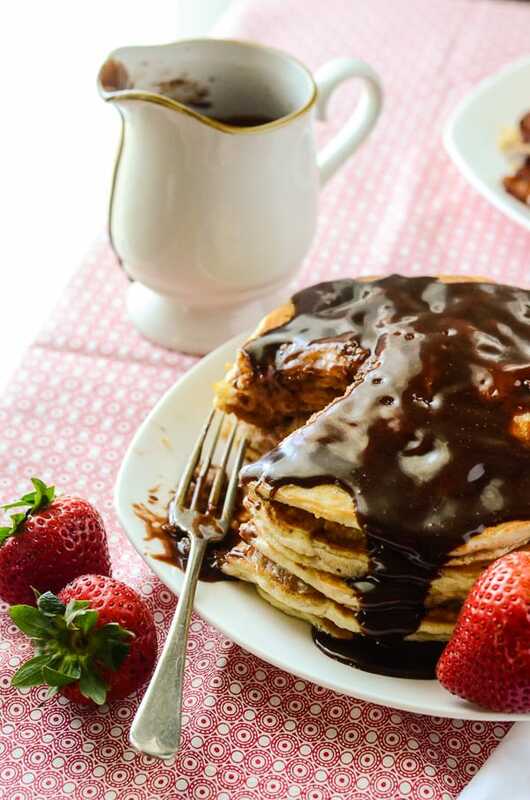 Skip the extra sugar and sweeten these perfect Strawberry Pancakes with Nutella Syrup, an easy recipe even your kids can whip up! I wish I was the one who invented Nutella. And not because of the money, either. I mean, that would be quite the perk, but I would just love to be able to say that I was the creator of the chocolate-hazelnut genius product that makes so many people’s mouths happy. There is literally nothing bad about that stuff…especially when it’s paired with fruit. 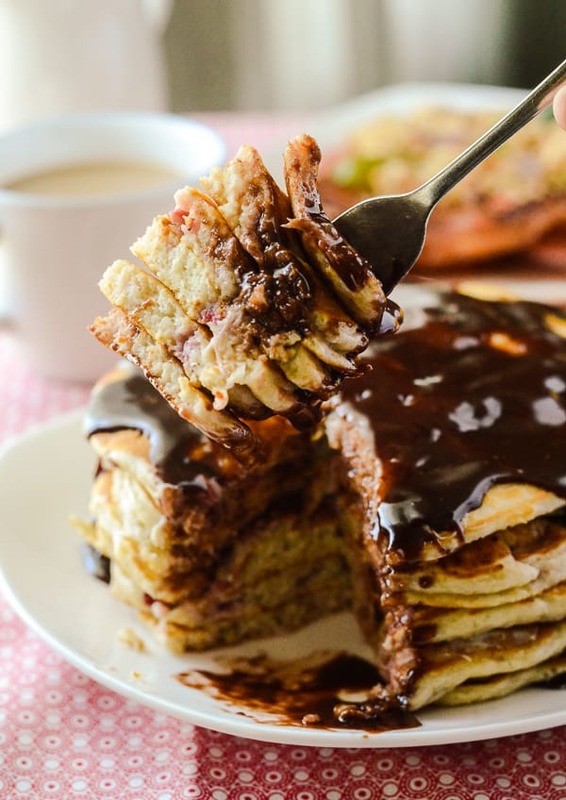 Or turned into breakfast topping…saaaay helllllooo to my liittle fraaands, Strawberry Pancakes with Nutella Syrup. It all starts with the perfect pancake. 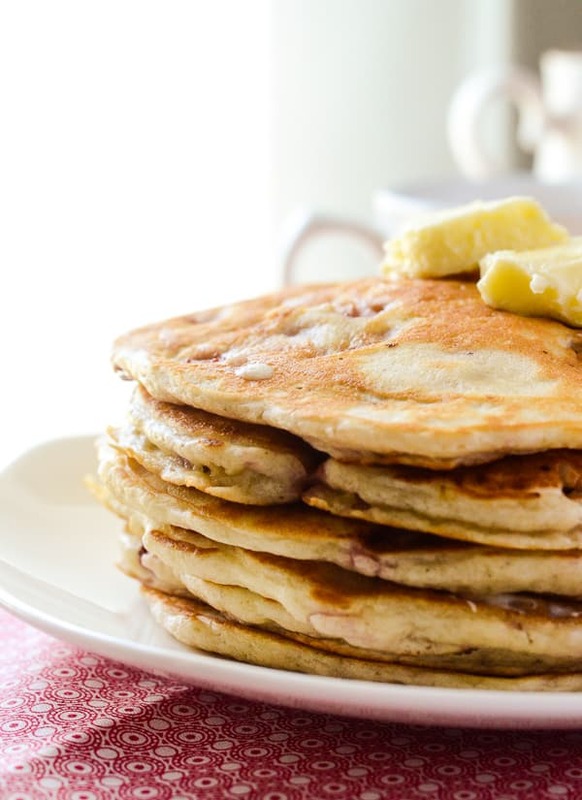 The most essential part of the perfect pancake in the ingredient that makes them so tender and tasty – buttermilk. Let’s be real. Go look in your fridge. Do you happen to have a carton of it in there? Unless you’re over the age of 80, or really into tangy dairy, chances are you don’t. It’s not exactly a sippin’ drank. My Papa actually used to down the stuff religiously, and I remember sitting on his lap at the kitchen table ( I must have been about 4,) making faces when he would offer me a taste. Once was enough for me to know it wasn’t for me. Chocolate milk or nothing! I personally only buy it for bulk baking, and I freeze the leftovers in ice cube trays and thaw it as I need it afterwards. But when I run out, and need some for a recipe…thank goodness for the internet! A little lemon juice + regular milk, and in ten minutes you have makeshift buttermilk for baking. 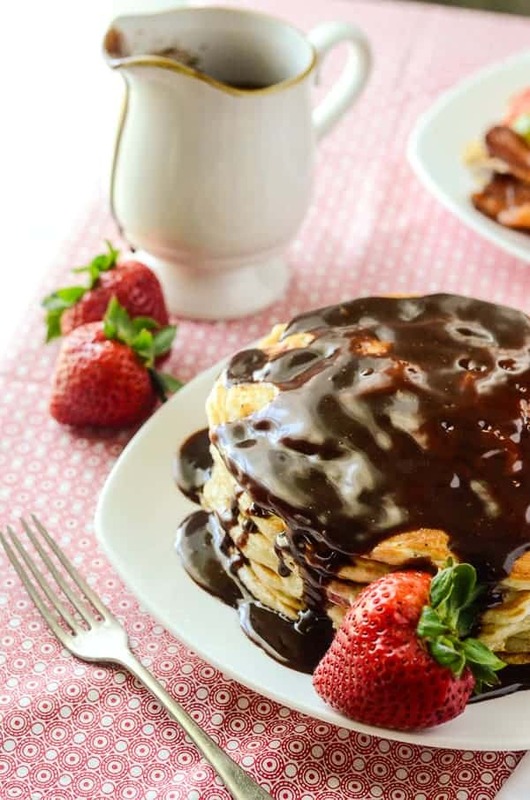 Mix it up with some other important pancake ingredients, fold in some fresh Florida strawberries, and whip up a batch of this incredible, chocolatey, possibly sinful Nutella Syrup, and you’ve got yourself a breakfast your family will rave about. And likely ask for again the next morning. No pancakes for me today, but I will be knee-deep in strawberries this weekend! I’ll be spending some quality time with over a dozen lovely Sunday Supper ladies, enjoying some incredible Tampa dining establishments, and learning this and that about blogging, photography, and the life of the Florida strawberry. Care to live vicariously? Keep an eye on my social media outlets – I’ll be updating them constantly over the weekend! Heat griddle to 350 degrees F.
Combine milk and lemon juice in a measuring cup, and allow to sit for 10 minutes. Whisk. In a large bowl, whisk together dry ingredients. Make a well in the middle, set aside. In another bowl, add milk/lemon juice mixture, eggs, melted butter, and vanilla. Whisk until well combined. Add wet mixture to the middle of the dry ingredients. Whisk together until just incorporated, then gently fold in strawberries. 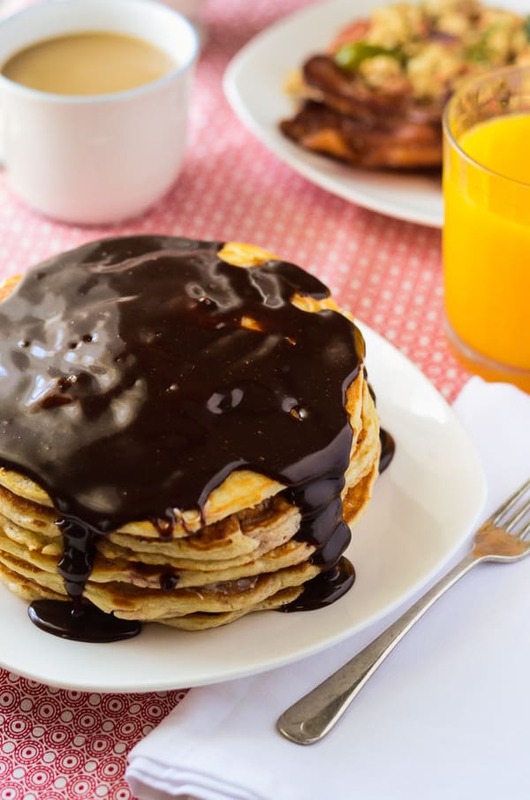 Spray griddle with non-stick cooking spray, and use a triggered ice cream or large cookie scoop to portion out pancakes. 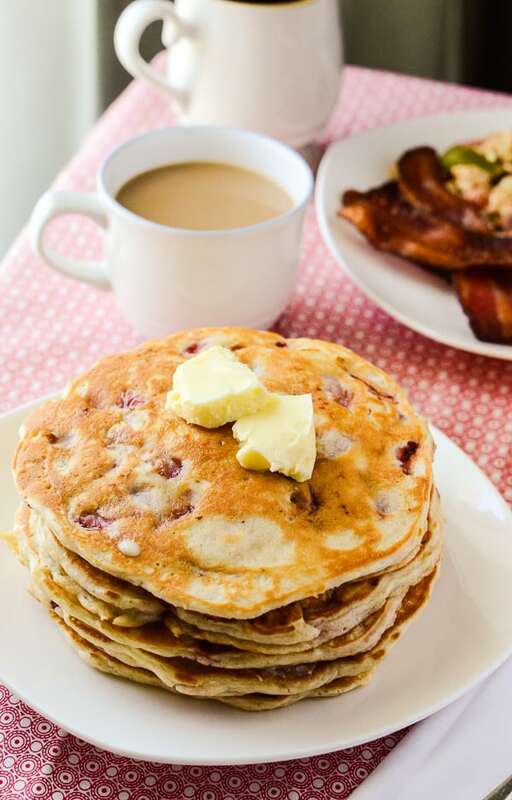 Cook until bubbles form on tops of pancakes, and they begin to look dry (1-2 minutes,) then flip and cook another minute or so until golden brown. Repeat until all batter is used. In a measuring cup or microwave-safe bowl, combine heavy cream and butter. Microwave in 30-second increments until butter is melted. Mix together with a rubber spatula, then add Nutella and vanilla and mix until smooth. If a thinner consistency is desired, heat more cream and blend in. 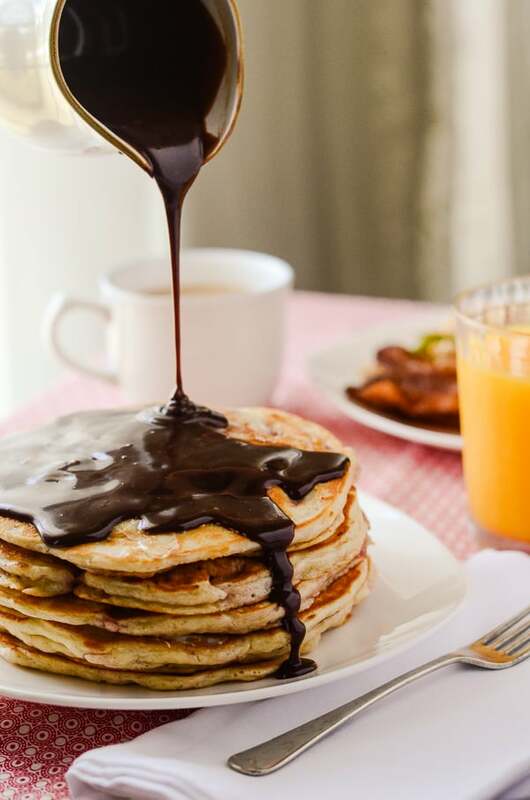 Pour over buttered pancakes, and enjoy! What does your perfect weekend breakfast consist of? I hardly ever keep it on hand, but I use that milk and lemon juice trick all the time. And I cannot wait to make these pancakes because you cannot beat the strawberries and nutella combo. Mmm.